Imagine sitting down at a fancy restaurant, calling the waiter over, and ordering a loaf of sliced bread as an appetizer. You request, “Make sure it contains extra germ, please!” Doesn’t sound too appetizing, does it? The truth is there are some germs out there that are actually good for you. 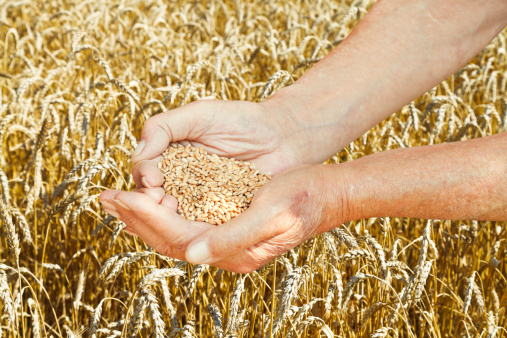 Let’s take a look at the benefits of nutrient-dense wheat germ. Wheat germ is the part of the wheat grain that can reproduce and become a plant. It doesn’t account for much of the grain, measuring in at barely three percent of it; however, as wheat germ grows, it feeds off the grain’s endosperm, which constitutes 83% of the grain. The endosperm is the carbohydrate that eventually gets ground into the flour, but because refined flour only uses the endosperm and leaves out the healthy germ portion, it lacks nutritional value. This is why you need to supplement your diet with added wheat germ.It’s important to note that wheat germ contains a lot of gluten, so if you are gluten-intolerant, you should refrain from consuming it, as it’ll most likely make you sick. Wheat germ can be the perfect addition to your diet! Since it’s packed full of fiber and minerals, it can help cleanse your body, combat constipation, improve digestive health, and increase your metabolism. It contains vitamin E, which can help increase your energy. The phytosterols found in wheat germ can prevent your body from absorbing too much fat, which is especially beneficial if you’re trying to lose weight. The presence of linoleic acid in wheat germ can encourage more oxygen uptake, help to improve circulation, and help protect against cellular damage. How Should I Take My Wheat Germ? 1. Supplements: It can be difficult to locate wheat germ; the pharmaceutical industry has compressed all of its nutrients into one pill. 2. Powdered form: If you’re not comfortable taking wheat germ in pill form, you can take it as a powder. It’s quite simple; all you need to do is dilute the wheat germ powder in water. Take two teaspoons half an hour before each big meal. 3. Flaked: Another popular way to consume wheat germ is by adding small flakes of it to your meals. This might be the most useful and natural way to consume it. Slowly boil the milk in a saucepan; then stir in the quinoa. Decrease the heat to medium- low, cover, and cook for about 20 minutes or until the milk is absorbed. Then turn up the heat a bit to medium and stir on a consistent basis for about five minutes. Once the milk has been completely absorbed and the quinoa is completely cooked, add in the maple syrup and almonds and mix accordingly. Preheat the oven to 350 degrees. In a big bowl, mix the wheat germ, baking powder, flour, baking soda, salt, and sugar. In a smaller bowl, add eggs, oil, milk, sour cream, orange zest, and orange juice. Add the liquid mixture you just blended together to the large bowl with the dry ingredients and stir it accordingly. Once all of the ingredients are properly mixed, pour the batter into an eight-by-four-inch loaf pan and cook up to 55 minutes. Preheat the oven to 350 degrees. In a small bowl, mix the flour, baking powder, wheat germ, and baking soda. In a medium-sized bowl, mix together the cream and brown sugar until it is light and fluffy; then add the peanut butter and egg. Combine the flour mixture into the medium bowl and slowly stir in the oats, cherries, and walnuts. Place the batter on a cookie sheet and cut into smaller three-by-two-inch bars. Preheat a waffle iron. Place all of the ingredients in a large bowl and whisk together. Once the ingredients are mixed, pour the mixture into the waffle iron and bake for five minutes. Preheat the oven to 350 degrees. Cream together the almond butter and unsalted butter in a large bowl. Add the egg; stir in the cookie mix and wheat germ until all of the ingredients are combined. Carefully place round tablespoons onto a cookie sheet. Bake for 12 to 15 minutes or until they are lightly brown on the outside and fully cooked on the inside. Preheat the oven to 425 degrees. Mix the berries and sugar together in a medium bowl and put it to the side—this will be the topping. To make the shortcakes, mix the wheat germ, flour, baking powder, baking soda, and sugar in a medium bowl. Toss the butter and flour into the bowl; stir the buttermilk into the mix. Once mixed into dough form, place it on a cutting board and pat the dough into a nine-by-six-inch rectangle that’s about 3/4-inch thick; then use a round cookie-cutter to make small circles. Bake for about 14 minutes until they’re golden brown. Finish off the cooked shortcakes with the berry topping. “What Is Wheat Germ?” Kretschmer web site; http://www.kretschmer.com/about-wheatgerm, last accessed May 13, 2015. Gray, M.D., “How to add wheat germ to your diet,” OneHowto web site; http://health.onehowto.com/article/how-to-add-wheat-germ-to-your-diet-1552.html, last accessed May 13, 2015. Tags: Health Tips, Latest Health News, What Germ Recipes, Wheat Germ Benefits, Wheat Germ Health Benefits, Wheat Germ Nutrition.